Keynote Speaker, Filipino Intercollegiate Networking Dialogue (FIND) Spring Conference, Drexel University, March 28, 2009. Invited Workshop Facilitator for APA Heritage Month, “This is the History That We Share: Asian Pacific American Historical Timeline”, Retired Persons’ Association, Cambridge Center for Adult Education, May 11, 2009. Roundtable Panelist, Filipina Women & Power, Finding Filipino Identity Symposium, University of Michigan Union Arts & Programs, April 11, 2008. Keynote Speaker, “Empowering the Bayanihan Spirit: Learning Our Past for the Future”, Filipino Americans Coming Together (FACT) Conference, University of Illinois Urbana-Champaign, November 2-4, 2007. Guest Lecturer, Immigration & Community Issues for Asian Americans in Detroit, for American Culture 214: Introduction to Asian American Studies, October 25, 2007. 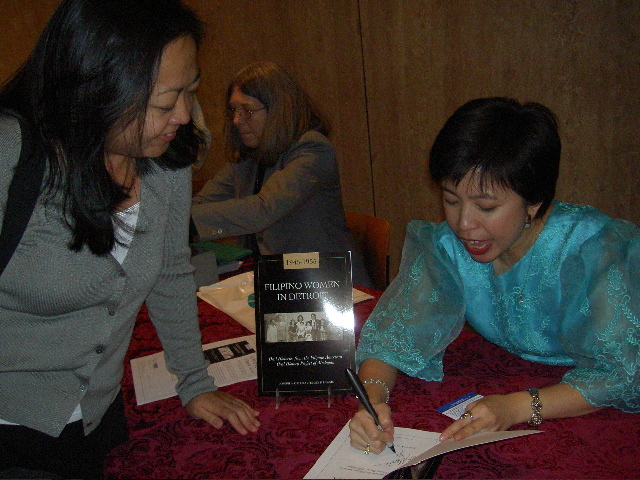 Invited Speaker, Filipino American History Month, Samahang Pilipino and Asian American Studies Center, University of California, Los Angeles, October 15, 2007. Guest Lecturer, How to Conduct Oral Histories, for American Culture 210: Introduction to Arab American Studies, October 2, 2007. Invited Workshop Facilitator, “Empowering Our Communities Through Oral History”, Allied Media Conference, Wayne State University, Detroit, June 23, 2007. Guest Lecturer, Filipino American & Asian American Activism in Detroit, for Women’s Studies 240: Introduction to Women’s Studies, December 11, 2006. Invited Workshop Facilitator, “Where Are You From? Poetry Workshop” Asian Pacific American Women’s Conference, Michigan State University, April 9, 2005. Guest Lecturer, How to Conduct Oral Histories, Lives of Urban Children & Youth (LUCY) Initiative, School of Education, & Global Intercultural Experience for Undergraduates (GIEU), University of Michigan, April 7, 2005 & September 11, 2002. Invited Speaker, Filipino American History, Midwest Association of Filipino Americans Conference, Michigan State University, February 26-27, 2005. Invited Panelist, “Filipino American Women: Pioneers and Trailblazers”, Smithsonian Institution, National Museum of American History, October 29, 2004. Keynote Speaker, Filipino American National Historical Society Midwest Regional Conference, Springfield, Illinois, October 25, 2003. Guest Lecturer, How to Do Oral Histories, Detroit Summer & Environmental Protection Agency Project, Catherine Ferguson Academy for Teenage Mothers, Detroit, April 14, 2003. Keynote Speaker, Project Lighthouse Campus Day, University of Michigan, April 11, 2003. Invited Speaker, “Balagtasan: Spoken Word & Performance” and “preSERVING Our Communities: The Filipino American Oral History Project of Michigan”, Midwest Association of Filipino Americans Conference, Ohio State University, February 21-23, 2003. Keynote Speaker, Association of Chinese Americans’ 19th Annual High School Achievement Awards Banquet, Warren, Michigan, December 1, 2002. Keynote Speaker & Workshop Facilitator, EmpowerAPA: Asian Pacific American Student Leadership Retreat, Kalamazoo, Michigan, October 11-13, 2002. Keynote Speaker, Pilipino Graduation, California State University, Northridge, May 25, 2002. Invited Speaker, “Pinay Power”, Midwest Association of Filipino Americans Conference, Michigan State University, February 22-24, 2002. Keynote Speaker, Filipino American History Month, California State University, Northridge, October 1, 2001. Invited Workshop Facilitator, “Power of the Pen: Creative Expression”, Midwest Asian American Students Union Conference, University of Michigan, March 23-25, 2001. Keynote Speaker, Asian Pacific American Youth Summit, Univ. of Michigan, February 17, 2001. Keynote Speaker, Alpha Kappa Delta Phi Sorority’s Charity Ball for Breast Cancer Research, University of Michigan, October 7, 2000. Invited Workshop Facilitator, “Filipino American Studies”, Filipino Intercollegiate Networking Dialogue (FIND) Conference, Rutgers University, March 10-12, 2000. Featured Radio Guest, “Filipino American History Month Special” Street Science with Dominique DiPrima, 92.3 FM The Beat, Live Radio Show, October 5, 1997. Invited Panelist, “Pinay History,” Feminist Research & Community Forum, Northwest Center for Research on Women, University of Washington, Seattle, January 11, 1996. A 1990s interview of Emily by Gladys Nubla, includes the poem "Notes from a University Writing Group (Or, From the Woman Who Told Me To Write White)"
Thank You 18 Million Rising! Kumusta Pamilya, Kababayans, and Kaibigans! Enter your email address to follow Emily's Events and receive notifications of new posts by email.